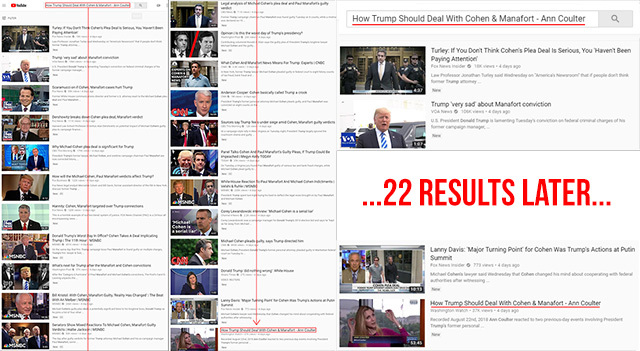 With YouTube's new search algorithm, if you search the exact title of Ann Coulter's recent appearance on C-SPAN you have to scroll through 22 unrelated results from establishment news organizations before you can find it. This is the new normal on YouTube for all news related search results. The exact same search on "Google Videos," which has not been given the same "show only 'trusted' sources" treatment, shows the video as the number one result, followed by three related videos from independent YouTubers which accurately reflect what the search was for. 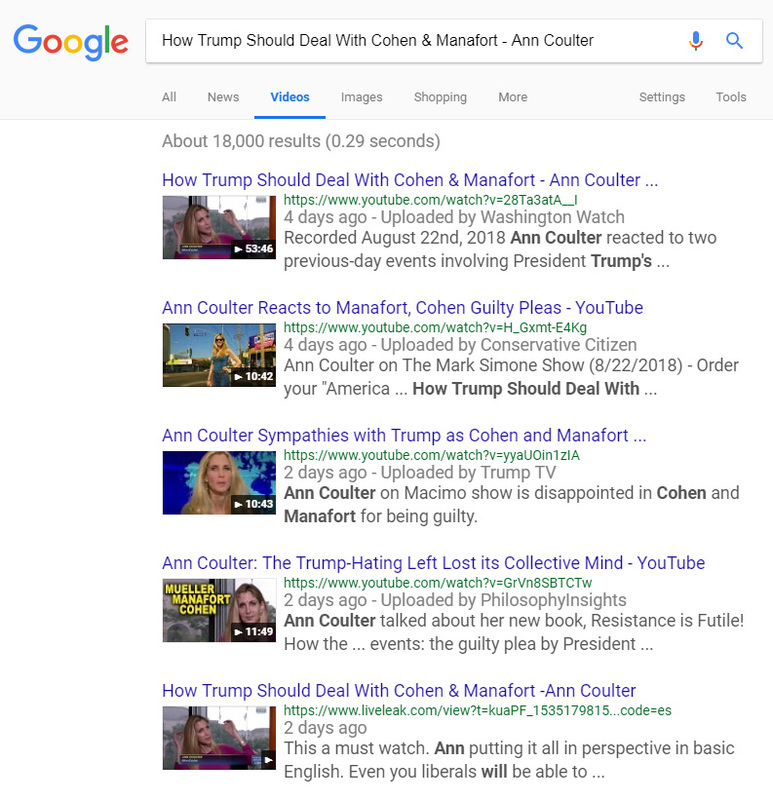 Google has turned YouTube search from a tool giving you access to millions of independent YouTubers to a censored, walled garden which gives you search results from a tiny cadre of establishment media outlets. YouTube can now be more accurately described as "TheyTube," as they've effectively censored 99.9% of channels from the first 20 search results on all news related topics. This is all being done to rig the midterms and crush alternative media to prevent anyone like President Trump from ever getting elected again. Incidentally, in the video itself with Ann Coulter on C-SPAN, Coulter discussed this censorship by Big Tech. "We are facing a crisis in free speech, right now," Coulter said. "The left has control of the mainstream media, Hollywood, Wall Street, Silicon Valley, the schools k through 12, [and] the universities." "All the social media companies [want to shut down] the one place you can actually go to get the facts [which] are these tiny little corners of the internet," she said. "We need to apply the First Amendment to social media companies like Twitter, Facebook, and Google, because it is a public square, and there is precedent for that and it's gotta be done, because this is really terrifying, and talk about chilling speech when they�re just throwing people off right and left," Coulter said. "Everything that liberals fantasized Joe McCarthy was doing is being done, now."